At SyntecOptics.com, we provide you with the most innovative, high- quality multi axis milling services. Banking on our superior multi axis milling capabilities, we can handle production volumes from prototypes to high volume. Possessing fourth and five axis cutting capability Wordingham Technologies is dedicated to providing our clients with the most innovative, high-quality multi axis milling services for their custom optics applications. Additionally we offer CAD/CAM programming and design review, cellular manufacturing, and print review for new projects to assist in reducing cost. This technology and our innovative thinking enable us to improve processes and techniques to drive down production cost and increase quality for every customer order. 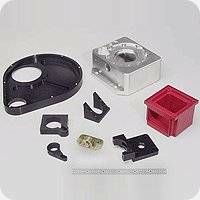 The ability of our milling centers to hold +/- .0001 of an inch precision tolerance gives us the ability to mill a variety of metal and plastic materials for many markets and industries such as law enforcement, military, medical, life sciences, metrology, laser marking, night vision(IR/NIR) and Semi-conductor. Our superior multi axis milling centers enable us to handle any production volume from prototype to high volume. Our NH4000 Horizontal Mill with ATC holding 180 tools, 6 pool pallet changer laser tool detection, temperature controlled coolant and Renishaw probing has increased our milling capability while reducing cost to customers by running multiple jobs or large volume single jobs unattended. Furthermore, we have milling centers with 20,000 RPM spindle speed, Renishaw probing and pallet changing capability. Wordingham Technologies is well equipped to provide a wide array of milling operations from drilling, boring, tapping and countersinking to 5th axis machining on components measuring up to 15 high x 16 wide x 29 inches in length. We invite you to contact our company to learn more about any of our advanced multi axis milling services.